It is rare that a box I receive is squeal worthy-- this is mostly because I do not squeal in delight over things, much less jump up and down over them. But that is what I am doing RIGHT NOW!!!!!! Social Bliss is one of the newer boxes out there, and it is NOT cheap. At $47.90 a month SocialBliss Style Box is a high end box. But I LOVE IT!!!! EEEEKKK!!!!! The card has a quote from Audrey Hepburn (my favorite actress EVER!!!! ), that says, "Paris is always a good idea). You all know I ADORE Paris!!!! 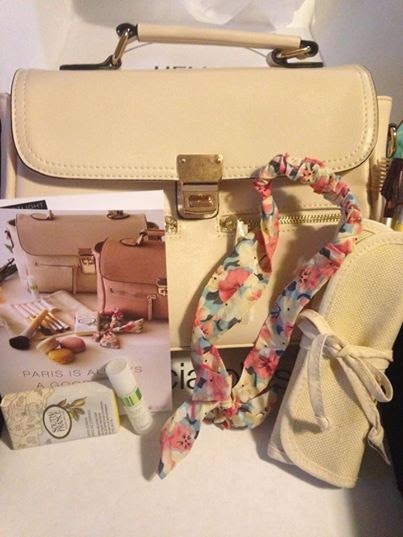 Total value: $86.03 which is a fantastic value for a bag that is HOT right now for Spring! I absolutely love this box and will keep on subscribing!!!! Go to: http://www.socialbliss.com/ to subscribe to your own box!! !Use code FBM5 to save $5! This post may contain affiliate and/ or referral links. We only recommend products we think our readers will enjoy. As always, our experiences and opinions are our own.